Research background: Budgeting was developed during the Great Depression as a mana-gerial tool to help enterprises survive a critical period characterized by fluctuations in mac-roeconomic indicators. Now, after more than eighty years, budgeting is criticized for the same reason why it was created — for lack of adaptability to unexpected changes in the business environment. Based on these facts, the presented study focuses on the specifics of budgeting in the current business environment. Purpose of the article: The aim of the work is to explore selected aspects of budgeting process in Czech firms, and to assess how the budgetary process is influenced by the pro-gression of the business environment. Methods: To achieve presented target, the authors designed the questionnaire survey sub-mitted to employees of companies in the Czech Republic. Findings & Value added: The first part of this paper displays the state of knowledge on budgeting, the following part presents results of the survey. 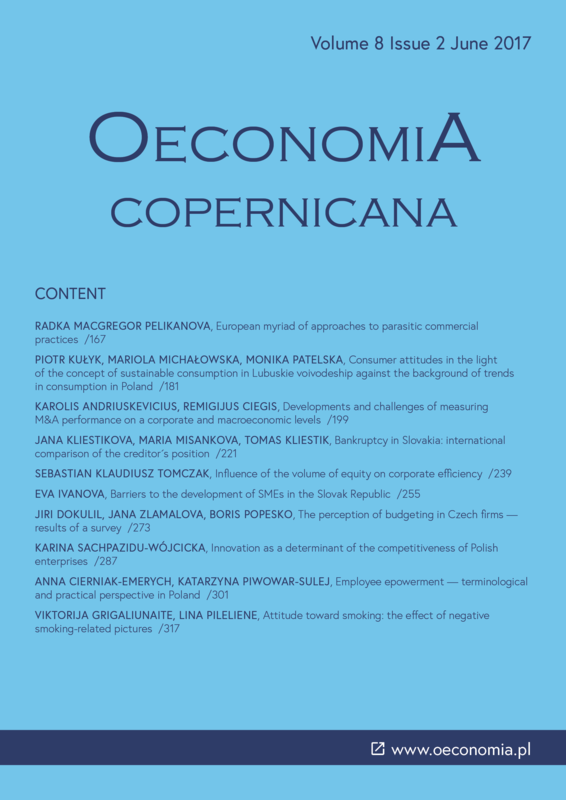 The study identified several trends, especially in the use of budgeting in Czech firms, characteristics of budgets in these subjects and evaluation of the sustainability of a company´s environment. Berland, N., Levant, Y., & Joannides, V. (2009). Institutionalization and deinstitutionalization of budget. Symmetrical analysis of rhetoric associated to the introduction of budget and Beyond Budgeting. 30ème congrés Association Francaise de Comptabilité (AFC). Strasbourg. Drury, C. (2000). Management & cost accounting. London: Thomson. Drury, C. (2015). Management & cost accounting. London: Thomson. Ekholm, B. G., & Wallin, J. (2000). Is the annual budget really dead? European Accounting Review, 9(4). Fernández, A., & Rodríguez, E. (2011). Itinerario histórico y situación actual de la disciplina presupuestaria empresarial. De Computis. Revista Española de Historia de la Contabilidad, 14. Garrison, R. H., Noreen, E. W. & Brewer, P. C. (2014). Managerial accounting for managers. New York: McGraw-Hill Irwin. Grebeníček, P., Hájek, O., Smékalová, L., & Danko, L. (2013). Support of business and innovations in strategic planning of regional development on the municipal level of the Czech Republic. Acta Universitatis Agriculturae et Silviculturae Mendelianae Brunensis. Hansen, S. C., Otley, D. T., Van der Stede, W. A. (2003). Practice developments in budgeting: an overview and research perspective. Journal of Management Accounting Research, 15. Hope, J., & Fraser, R. (2001). Beyond budgeting questions & answers. CAM-I. Hope, J., & Fraser, R. (2003). Beyond budgeting: how managers can break free from the annual performance trap. Boston, Mass. : Harvard Business School Press. Horngren, C. T., Datar, S. M., & Rajan, M. V. (2012). Cost accounting: a managerial emphasis. Upper Saddle River: Pearson Prentice Hall. Horváth, P., & Sauer, R. (2004). Why budgeting fails: one management system is not enough. Balanced Scorecard Report. Jensen, M. C. (2001). Corporate budgeting is broken—let’s fix it. Harvard Business Review, 79(10). Král, B. (2010). Manažerské účetnictví. Praha: Management Press. Libby, T., & Lindsay, R. M. (2010). Beyond budgeting or budgeting reconsidered? A survey of North-American budgeting practice. Management Accounting Research, 22(1). doi:10.1016/j.mar.2009.10.003. Lorain, M. A., Domonte, A. G., & Peláez, F. S. (2014). Traditional budgeting during financial crisis. Cuadernos de Gestión, 15(2). Mansfeldová, Z. (2005). Executive-legislative relations in the budgeting process in the Czech republic. Sociologický časopis, 41(3). Neely, A., Bourne, M., & Adams, C. (2003). Better budgeting or beyond budgeting? Measuring Business Excellence, 7(3). Neely, A., Sutcliffe, M. R., & Heyns, H. R. (2001). Driving value through strategic planning and budgeting. London: Accenture. Ostergren, K., & Stensaker, I. (2011). Management control without budgets: a field study of beyond budgeting in practice. European Accounting Review, 20(1). Popesko, B., Novák, P., Papadaki, Š., & Hrabec, D. (2015). Are the traditional budgets still prevalent? The survey of the Czech firms budgeting practices, Transformation in Business and Economics, 14(3C). Popesko, B., & Papadaki, Š. (2016). Moderní metody řízení nákladů: jak dosáhnout efektivního vynakládání nákladů a jejich snížení. Praha: Grada. Weygandt, J. J., Kimmel, P. D., & Kieso, D. E. (2009). Managerial accounting: tools for business decision making. Wiley. Wildavsky, A. B. (1986). Budgeting: a comparative theory of the budgeting process. Revised Edition. OECD Data. Retrieved form https://data.oecd.org/gdp/quarterly-gdp.htm#indicator-chart. Czech Statistical Office Retrieved form https://www.czso.cz/csu/czso/business_ cycle_surveys_ekon.